If you read my blog on a regular basis you know that I run to thrift shops on my lunch hour almost every day. With fall coming next month, I have been in search of items I can use in autumn vignettes for the inside and outside of my home. Hmmm! A couple of aluminum layer cake pans from the thrift shop could become pumpkins, right? $2 each. Especially when they are spray painted orange. I sprayed them inside and out. And how about some bottle openers for stems? Painted green of course. I used Rustoleum Cinnamon satin spray paint. Hunt Club green on the stems. Then find some garage junk drawer stuff. Handles, washers, wing nuts, etc. Hammer the bottom side of the cake pan with a small hammer, and sand the edges to rough it up a bit. 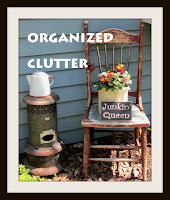 Then glue on some metal junk for eyes, a nose and a mouth on your "Junkin Punkins". I used E6000 to attach them. Let them dry overnight to cure the glue. Then glue the green bottle openers to the back rim of the cake pan. I will not hang it from the bottle opener. It's just for looks. (The glue may not hold) The cake pan will hang on a nail under the pan's rim. Upcycled cake pans as "Junkin Punkins"! Too soon to display them outside! so cute and creative!! 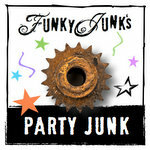 I love your junk'n punk'n! Now how cute are those. Have to pin those. So creative, I love it. That is thinkin outside the pumpkin. They are the cutest! You're so creative! I really think only you would see 'pumpkins' from pie plates and junk! Love them!!!!! Aren't they cute! I never would have thought of making them out of cake pans. In awe of your creativity! Simply too adorable!!! Honestly, I am blown away by your creative mind! I can't believe how you put this all together.. You're amazing! I love that! I'm looking for recycling crafts to do with my cubscouts and something like that would be so cool! You have no idea how much I adore this project Carlene!! Oh my..it's just fabulous and the perfect fall decoration for garden or home! I want one! I will say that if the glue doesn't hold...use magnets..then you could change the faces around sometimes! What an imagination you have, these are just too cute!! Can't wait to see what you do with them. Carlene! Those are so clever, I love them. Crazy clever idea! Junkin' punkins' for sure. Love those junky pumpkins Carlene! Such fun faces. I have to tell you I have been in the mood to get making something fun. I did repaint my old bike and plant it for Fall. The other day I went to a thrift shop to look for old metal trays that I want to use for some of my Halloween vignettes. They wanted $10 for two of them and one was marked $5. I told the lady that I didn't want to pay 10 because they were just for Halloween. She said, "that's what everyone wants them for." Anyway, I walked away with just the $5 one. Liked the shape of it best anyway. I'll keep my eyes out for more at a better price. I always want to try this! thanks for the reminder!